First things first, this is definitely a Star Wars film. Abrams (and the teeming folk whose hard work the director takes credit for) have done a fantastic job of making Episode VII look, sound and feel like an extension of the original trilogy. This might seem obvious, but it’s one place (the key place, for me) where the sequels fell wide of the mark. The visual effects are awesome, but so it the sound. The roar of TIE Fighter engines, the whummm of the force, designs that mirror and evolve the original Ralph McQuarrie masterpieces… Plenty of settings have called themselves Star Wars, and failed at all these things. It’s one of the reasons the trailer resonated with so many of us – it sounded like Star Wars. Yes, there are plenty of tweaks and evolutions along the way, but they’re almost all done with a respectful touch. Visually, Star Wars is Stormtroopers, TIEs, X-wings, astromechs and like. You can’t just keep the Jedi (as the prequels and a lot of Expanded Universe material were wont to do) and expect it to feel authentic. Some folk have talked about the fact there might be too much continuity referencing and fan-pleasing. As a lifelong Star Wars fan, this is a hard one for me to judge, but on balance, I think it’s fine. One brief line of dialogue aside, there’s nothing that really distracts from the film, and it really does help tie everything back to the original trilogy (and that line distracted me because I couldn’t work out whether it was weird crowd-pleasing, or a hint at something yet to be revealed). Beyond design, you’ll recognise a lot of parallels to earlier Star Wars films in scenes, settings and even story beats. Again, I didn’t find this intrusive – your mileage may vary. Tropes are tropes for a reason: when done well, they work. 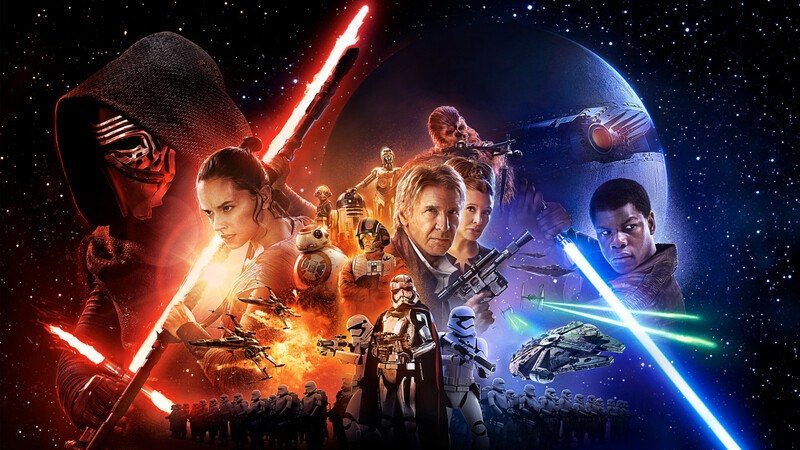 Episode VII does them very well indeed, without ever going beyond tropes and into cliche. It also strives to put its own spin whenever it can, and remains firmly within the bounds of homage. When Episode VII does break out of repeating old ideas and attempts its own world building, it’s not always successful. The vying factions are so similar to others we’ve seen before that I don’t honestly see why they renamed them, other than to create fodder for new franchise films/books/etc set before Episode VII. There’s one story beat, in particular, which parallels a pivotal scene from A New Hope, but the stakes are so poorly established that it loses almost all of its emotional impact. (When spoiler season is done, I might compare the two scenes in detail, because there’s a couple of great writing lessons to take away.) Also, the movie wants you to take matters on trust a few too many times, most noticeably about five minutes from the end (I’ll talk a little bit about this later). Nonetheless, when Episode VII hits the target, and it does so far more that it misses, it really hits the target. There’s an emotional core beneath the flash of lightsabers and blaster-fire and, if anything, it probably offers deeper motivations than any Star Wars film to date. While Episode VII’s world isn’t always convincing, its characters feel fully developed, and (for the most part) utterly convincing. Their depth does a lot to paper over the cracks in the setting, which is far preferable to the reverse. The new cast is, by and large, excellent. Oscar Isaac makes an instant and likeable impression, as do John Boyega and, to a lesser extent, Daisy Ridley and Adam Driver. One of my biggest worries going into Episode VII was that my beloved heroes from the original trilogy would be replaced by twenty-somethings plucked from the same shallow talent pool that fuels most BBC productions at present. This hasn’t happened. All four are completely convincing, and a joy to watch, switching between ice-cold seriousness and humour at exactly the right moments. If I had to niggle, I’d say that Ridley isn’t as strong as her co-stars, simply because there are some moments in the film where she settles into ‘Look at me! I’m acting!’ mode and offers a few overblown emotes. But this is a niggle, and if this is our new ongoing cast, then Star Wars has a bright future. Naturally, the cast is larger than a foursome, but I’m not going to talk about the other franchise newcomers, simply because most of the other characters didn’t leave much of an impression other than ‘Ah, that’s what the toy’s called.’ You’ll see what I mean when you see the film. The returning cast? It’s more of a mixed bag than our core of newcomers – not because of the talents of those involved, but because they don’t always get a chance to shine. The returning actors who get plenty of scenes steal every single moment the camera is on them. It’s one of the reasons I’m inclined to forgive Ridley’s overwrought moments – I don’t envy anyone who has to share screentime with an industry veteran whose quirky smiles and furrowed brows tell us more about the character’s thoughts than the script they’re reading. However, if you’re expecting to see a lot of the original cast, you’ll probably be disappointed – but there are already loads of characters floating around this film, so it’s not hard to see why it worked out this way. There’s the definite promise of more to come, but this leads into the film’s biggest problem. Sad to say, Episode VII falls into that very modern trap – it’s not just a standalone film, it’s the start of a series. Marvel gets a lot of stick for creating this problem (or rather, making it popular), but at least their films tell a complete story end to end, without slapping you about the face with the promise of a sequel. Episode VII suffers here, and sometimes in unusual ways. The plot focus wobbles, though you’ll not likely notice until quite late on, when you realise that one or two big reveals simply won’t happen in this film, despite tacit promises to the contrary. JJ Abrams swore there wasn’t post credits scene in Episode VII, and it’s kinda true, in that there’s no more movie once the credits roll. However, the last few minutes of the film are little more than a post-credits stinger – they’re just on the wrong side of the credits. That this scene is vital to the resolution only underlines a larger structural problem which I can’t really discuss given the spoiler-free nature of this review. I’ll simply say that it’s a disappointingly meandering payoff to an otherwise pacy movie. It’s aiming for Empire Strikes Back, but feels more like Return of the King. The dribbly ending, and the symptoms that produce it, is the reason Episode VII doesn’t quite stand shoulder to shoulder with the original trilogy. Nonetheless, it remains an awesome, rip-roaring space adventure of the kind we can never have enough of. Strong characterisation, breathtaking effects, and excellent performances make this a triumphant return to a galaxy far, far away. If you haven’t already, go see it. Posted in Featured Blogs and tagged Movies, Reviews, Star Wars. First off, thanks for posting up your thoughts! Without getting into spoilers, I personally thought the ending stands side-by-side with the quality of the original trilogy’s endings. The film tells you again and again how it will end, but it still doesn’t quite prepare you for that final image and the promise it brings. Does the film stand on its own as much as A New Hope did back in 1977? Certainly not. But the final five minutes to me aren’t meandering, they’re the promise of something wonderful ahead.